For our wedding, Kevin & I had purchased packages of blank cardstock with corresponding envelopes in hopes of using them to print the invitations Kevin designed and send those out to our guests. Well, a few explicit words and hours later, we realized our printer wasn’t going to cooperate with the cardstock size so we scrapped the idea and were left with about 150 blank cards & envelopes. After we moved to Harrisonburg following our wedding, we agreed to use these to make cards for our families and friends for everything ranging from birthdays and new babies to a quick note for a smile. This has been an awesome chance for us to get in touch with our creativity and design personalized cards for all the wonderful people in our lives. Not only that, the real reason we wanted to do this was to make people happy by receiving a tangible note in the mail and give them a break from all the boring bills and ads they normally find. The packages of cards & envelopes were around $5 for 50 at Michael’s, and we use scrapbook paper scraps from other projects and markers to dress them up a bit. 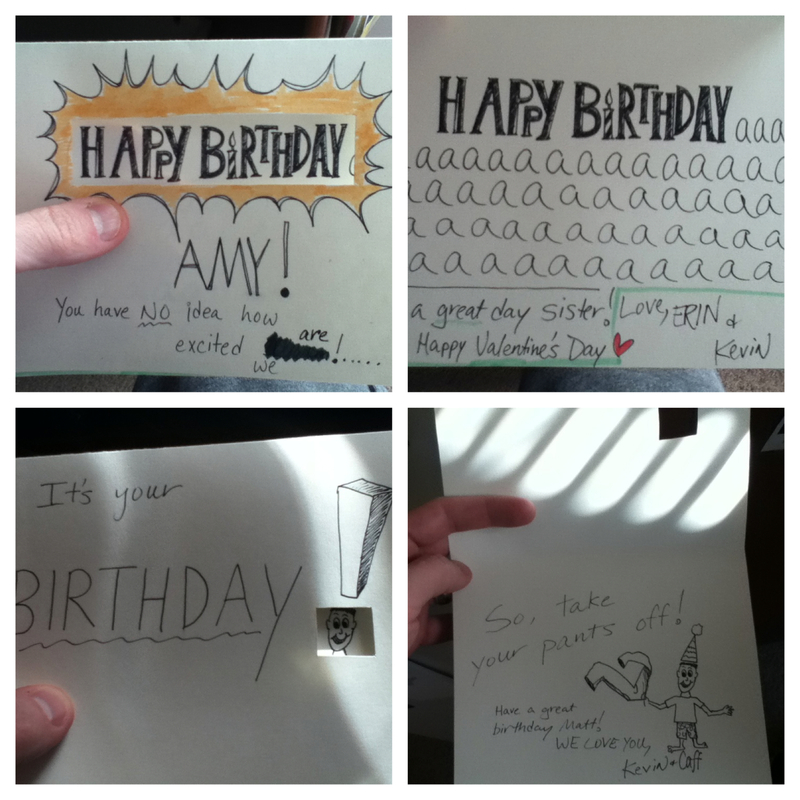 Since Kevin’s more of an artist than moi, he likes to sketch great pictures onto his cards. In addition to these cards, I came across a whole stack of old blank thank you cards I’ve had forever that my mom gave me when I was younger. Guess I didn’t do a good job of using them then but at the start of the new year, we vowed to thank people more often and show them their thoughtfulness does not go unappreciated. That began as simply sending out thank you notes for the holiday gifts we received from people, and we hope to continue this by thanking people for everything from gifts to time spent with us. Speaking of weddings yet again (yea, it’s still fresh on our minds), we are still amazed at how grateful we are to receive a personal thank you from the bride & groom. It definitely makes us feel as though we weren’t simply at their wedding to provide a gift but rather to support them as they journey into marriage together. We acted on those feelings with our own wedding, and since we didn’t register or ask for gifts, we sent thank you’s out to all of our loved ones who shared that day with us just to say it meant the world to us to have them there. Sixty cents to create some magic in someone’s life? Yea, it’s actually easier done than said! This entry was posted in Uncategorized and tagged birthday cards, snail mail, thank you cards, The Last Lecture on March 6, 2013 by caffreem.